The immunopeptidome presented by 27 HLA allotypes. (A) Total number of nonredundant MAPs and their source genes in the immunopeptidome of 18 B-LCLs compared with an expected binomial distribution. The curve depicts the expected number of source genes if all genes had a similar ability to generate MAPs. The black diamond shows the actual number of source genes (n = 6,195) observed for 25,270 MAPs (P < 1 × 10-250, binomial test). (B) Histogram showing the number of MAPs generated per MAP source gene (range = 1–64). 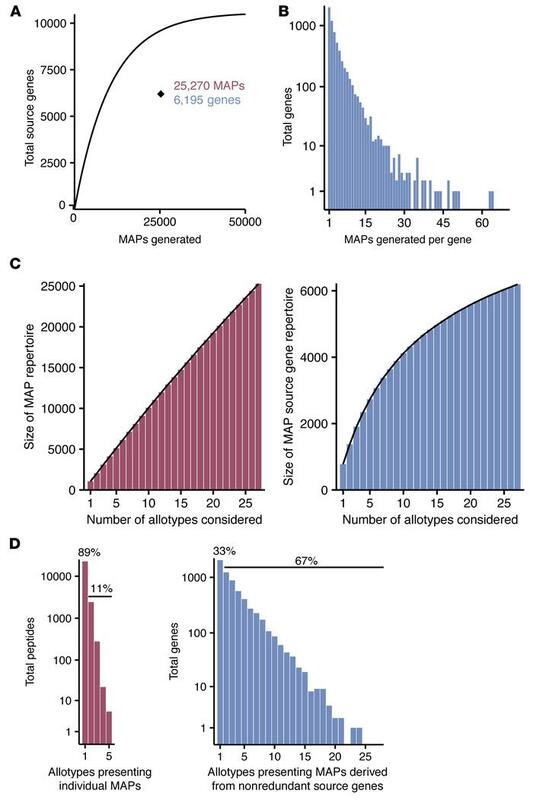 (C) The number of unique identifications of MAPs (left panel) and MAP source genes (right panel) was counted for various numbers of randomly selected HLA allotypes. Results show the average of 1,000 simulations. (D) The promiscuity of antigen presentation for MAPs (left panel) and their source genes (right panel). Histograms show the number of allotypes associated with each peptide or gene.